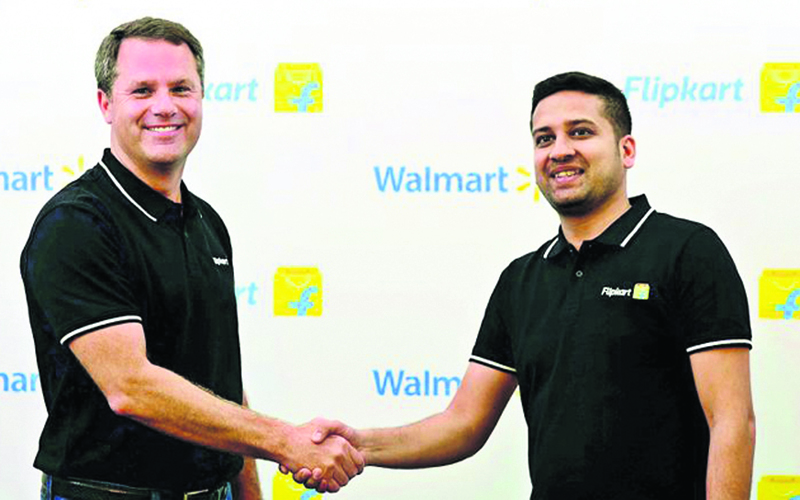 In the world's biggest-ever e-commerce acquisition, India's largest e-commerce company Flipkart agreed to sell 77 per cent stake to US retail giant Walmart for $16 billion. Walmart also plans to put in $2-3 billion as fresh equity into the company to strengthen its hold on the firm. The largest investor in the e-tailer, SoftBank confirmed that Walmart-Flipkart agreement was made. Analysts believe the trade would pit Walmart head-to-head against Amazon, one of the world's fastest growing markets. As the e-commerce battle in India hots up even further with the latest development, Amazon, meanwhile, put in £260 million into its main India unit, Amazon Seller Services, taking the total capital infusion into the entity to over £1.07 billion in a little over a year. Walmart CEO Doug McMillion arrived in Bengaluru to make the announcement of the deal. He asserted that Walmart's cash-and-carry business was intended to help the farming community in India. He added that the company's operations could help with both, the supply chain as well as the cold chain. “Make in India is something exciting for us,” McMillon said. He also said that 95 per cent of what Walmart sells in India is procured locally. He said he sees cash-and-carry and online retailing as two different types of businesses and predicted that India would have more than two major players vying for a share of its rapidly expanding e-commerce market. He pointed to the differences in the nature of Walmart's existing operations in India and Flipkart's business, when asked whether a merger of the two companies' current operations was on the cards. Flipkart's largest shareholder, SoftBank, may come to a deal with Walmart in the next few days to sell its stake, people close to the development said. "SoftBank and Walmart have agreed on a price and a final decision is expected in 7-10 days," they said. This comes a day after the Masayoshi Son-led telecom and internet company was suddenly having second thoughts about selling its stake in Flipkart at this point of time. SoftBank is the largest shareholder in Flipkart, and when Walmart announced that it would buy a 77% stake in Flipkart, there was no question that it included Soft-Bank's 22.3%. Since then, there is said to have been a debate within SoftBank over the advisability of selling now because of the steep 40% short-term capital gains tax it would have to pay. SoftBank acquired Flipkart shares less than a year ago for $2.5 billion, and according to Son, that stake is currently worth $4 billion. SoftBank would thus have to hand over about $600 million to the Indian taxman - out of a profit of about $1.5 billion. "Walmart wants to make sure that a higher price is not asked for at a later date by SoftBank," a person privy to the matter said.